We’d love your help. Let us know what’s wrong with this preview of A Bloody Business by Dylan Struzan. In 1919, the National Prohibition Act was passed, making it illegal across America to produce, distribute, or sell liquor. With this act, the U.S. Congress also created organized crime as we know it. Italian, Jewish, and Irish mobs sprang up to supply the suddenly illegal commodity to the millions of peopl ON THE 100TH ANNIVERSARY OF PROHIBITION, LEARN WHAT REALLY HAPPENED. In 1919, the National Prohibition Act was passed, making it illegal across America to produce, distribute, or sell liquor. 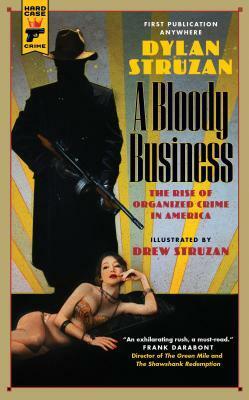 With this act, the U.S. Congress also created organized crime as we know it. Italian, Jewish, and Irish mobs sprang up to supply the suddenly illegal commodity to the millions of people still eager to drink it. Men like Lucky Luciano and Meyer Lansky, Dutch Schultz and Bugsy Siegel, Al Capone in Chicago and Nucky Johnson in Atlantic City, waged a brutal war for power in the streets and on the waterfronts. But if you think you already know this story…think again, since you’ve never seen it through the eyes of one the mobsters who lived it. Called “one of the most significant organized crime figures in the United States” by the U.S. District Attorney, Vincent “Jimmy Blue Eyes” Alo was just 15 years old when Prohibition became law. Over the next decade, Alo would work side by side with Lansky and Luciano as they navigated the brutal underworld of bootlegging, thievery and murder. Alo’s later career included prison time and the ultimate Mob tribute: being immortalized as “Johnny Ola” in The Godfather, Part II. To ask other readers questions about A Bloody Business, please sign up. Writing a long novel about historical event is a tricky business: the people most likely to pick it up are the people most likely of knowing how it ends. It's exactly what happens here. The selling point of this novel is not how it ends, but how it really happened. Some sort of dramatized secret history if you like. Told by one of prohibition's key figures Jimmy Alo. I mean, this is not a bad novel. There are some killer character moments, which pleasantly color your reading. Featuring notably Me Writing a long novel about historical event is a tricky business: the people most likely to pick it up are the people most likely of knowing how it ends. It's exactly what happens here. The selling point of this novel is not how it ends, but how it really happened. Some sort of dramatized secret history if you like. Told by one of prohibition's key figures Jimmy Alo.